Oops, it’s been a while. Let’s just say I’ve been really busy? Or snowed in. That was fun (not). But the weather is now thoroughly gorgeous! Snow and 75 degrees in the same week… shway crazy, welcome to Jordan. 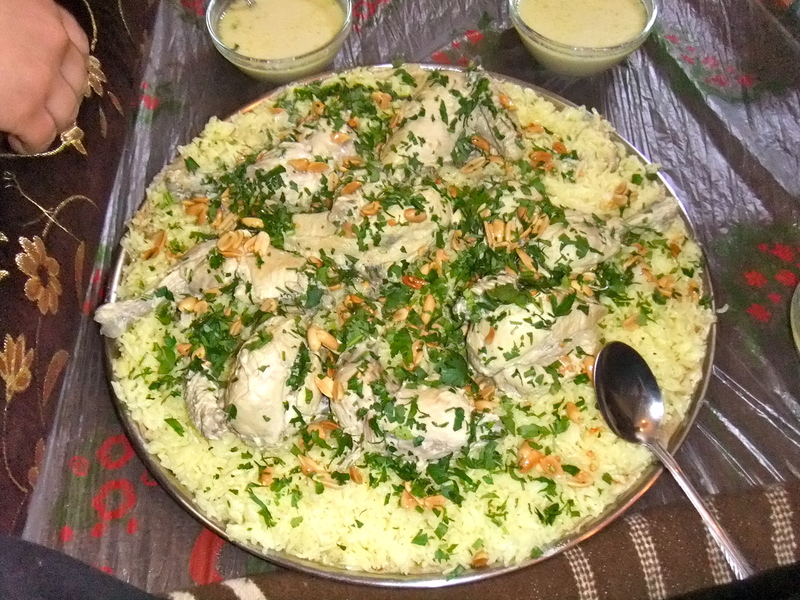 Since I last posted I have had mansaf TWICE. Once with our friend in Al-Baq’a and then once again at a restaurant. Eating at the house was awesome and totally an experience. Only problem is… I never learned how to eat with my hands only. Like seriously. I eat ribs with a fork and knife. In Jordan, there are a lot of things you eat with your hands, generally with bread as your only “utensil”. Mansaf is not like that. Generally a bed of rice (and sometimes also bread), with chicken or lamb on top, with a yogurt based sauce that you pour over all if this. That monster plate of chicken mansaf is for three women. THREE!